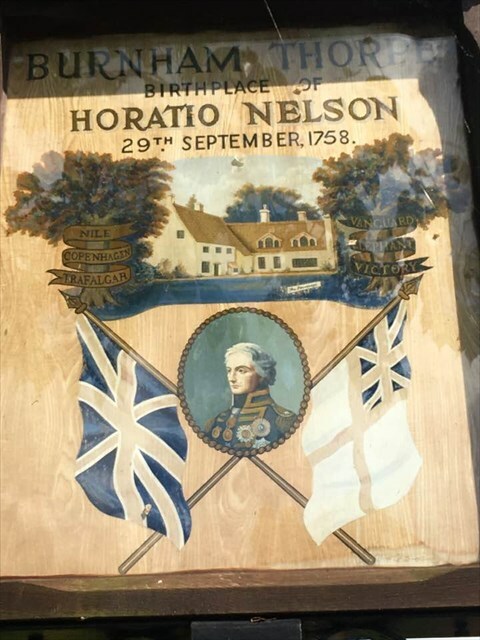 A hand painted sign showing Lord Nelson and listing the battles that he fought and the names of his Ships. Burnham Thorpe is a small village and civil parish on the River Burn and near the coast of Norfolk, England. It is famous for being the birthplace of Vice Admiral Horatio Nelson, victor at the Battle of Trafalgar and one of Britain's greatest heroes. At the time of his birth, Nelson's father, Edmund Nelson, was rector of the church in Burnham Thorpe. Nelson's father, Revd. Edmund Nelson was rector of the Church of All Saints in Burnham Thorpe, and the church can still be seen. The lectern is made with oak from the HMS Victory. There is a small exhibition inside detailing Nelson's career.